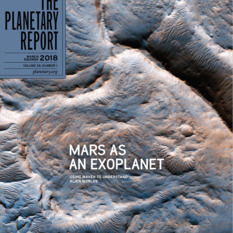 Donna Stevens was a key staffer The Planetary Report t for more than 35 years and its senior editor for a decade. 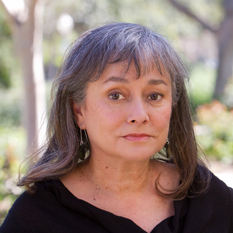 She shepherded it through all the stages of its development, from story assignment through its arrival in members’ mailboxes. 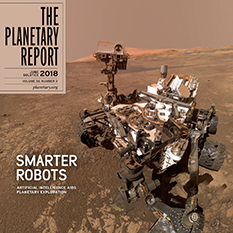 As senior editor of the magazine, her first priority was to give everyone in The Planetary Society a high-quality print publication that is a tactile connection to the many aspects of space exploration and the work we all—as a family—do to make that exploration happen. 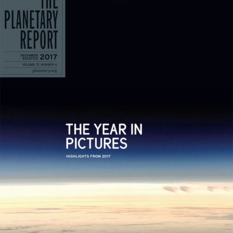 With her long history as the Society’s art editor, Donna especially enjoys her role as interface between the written and visual aspects of The Planetary Report. She has now retired but is still involved with the Society, working to archive its visual legacy.